The problem associated with finding cure for a disease or illness is always more when the illness or disease has not been identified properly. That is the reason why the medical practitioners usually diagnose their patient through several diagnosis methods to ensure they find out or identify the disease before finding cure or treatment. The Petechial hemorrhage is one of the diseases unknown to many people making it difficult for some people to find cure or suitable treatment it. This is a small pinpoint mark with reddish color known to be a vital asphyxia sign caused by obstructing the airways externally. Petechial hemorrhage is defined as a small reddish-purple spot found on the skin mostly caused as a result of blood release from capillary into the blood stream. It usually make surface of the skin look reddish as though one has allergic reaction over something. Whenever, you see something like that on your skin, you should quickly look for your doctor before it will be too late. There are several other causes as well as symptoms to this disease discussed below. 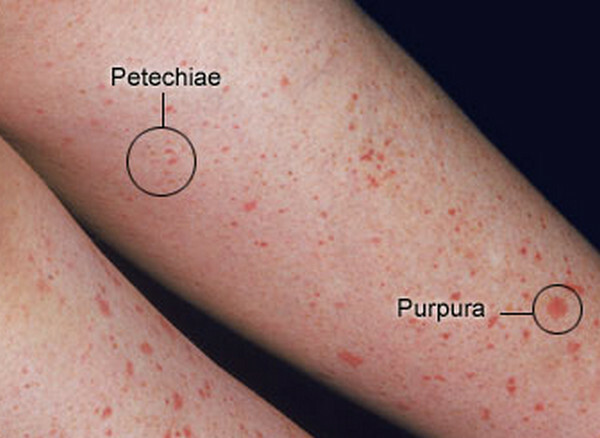 These little pinpoint with reddish purple color on the skin does not usually result to itchy. But, there are cases when the red pinpoint on the skin usually cause itchy experience of the patient. Some of observed and confirmed symptoms of this illness are: Blood accumulating under the skin, excessive gum bleeding, easy bleeding or bruising, hemartrosis also called joint hemorrhage, unexplainable nose bleeding, menorrhagia which is excessive blood flow during menstrual period. There are some major causes of petechial hemorrhage which you need to always suspect when you have this disease. But, it is always important that you contact your doctor to find out the particular factor that causes yours. Some of the major causes of this disease include: Prolonged straining resulting to petechia of the neck, chest as well as the face, Thrombocytopenia, Sun burns or injuries, allergic reactions, Sepsis, Malnutrition, autoimmune disease, strep throat, scarlet fever and other infectious diseases such as; cytomegalovirus, viral hemorrhagic fevers, endocarditis, hantavirus pulmonary syndrome, mononucleosis, idiopathic thrombocytopenic purpura, chemotherapy and radiation, meningococcemia etc. Cold press: While cold press does not cure or completely treat the causes of this disease, it is effective in reducing risk or reoccurring as well as inflammation. Vitamine Support: You can reduce the risk of inflammation on your Petechia with some certain vitamins. Some of the vitamins are the Vitamin C, Vitamin D, Vitamin K, and Vitamin B9, folate, Vitamin B12 and lots more. Supplement: There are some certain supplements known to be effective in treating Petechial hemorrhage and some of them include methysulfonylmethane, probiotics, thymux extract, digestive enzymes, protease enzymes and others.